Georgia House minority leader Stacey Abrams is showing one way forward. In the summer of 2013, about a month after the Supreme Court gutted the Voting Rights Act, I sat in a small church in Baker County, Georgia. The county elections board had proposed closing four of its five polling places, and I listened as a couple dozen residents of the sprawling, rural county figured out how to stop the plan. The board said its proposal was driven by a cost-benefit analysis; shutting the polling places would save money, a whopping $7,800. The residents of Baker also recognized the debate as one over value—the worth of black life. The county is nearly half black, and more than a third of its residents live in poverty; the board is majority white. This is a familiar dynamic in Baker County. Sherrod could have said the same about great swaths of southwest Georgia, and she could have spoken in the present tense. Which is one reason Stacey Abrams’s expected entry in the Democratic primary for next year’s governor’s race is so notable. 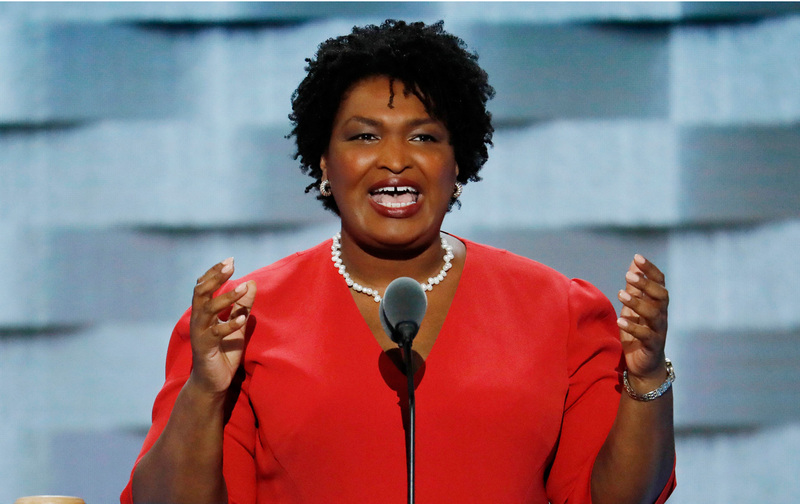 If elected, Abrams would be not just the only black woman to occupy the governor’s mansion in Georgia, she’d be the only in any US state. Ever. More than that, what’s notable for people like the black residents of Baker County is her strategy as the current House minority leader. In recent elections, Abrams has made the sadly novel contention that rural, largely black districts like those in southwest Georgia—which Democrats long ago wrote off as dominated by old power structures that can’t be upturned—are, in fact, worth the fight. She says a driving question for her is, “How do you build a state that thinks about everyone and not just those who happen to live in the right place?” It ought to be a driving question for progressive politics everywhere. Donald Trump’s presidency will end—likely hastened by the corruption that is gradually coming into full view. But Trumpism will not simply dissipate with his departure. The white suburbanites who gambled on his candidacy were driven by a real, if toxic, brew of fears and anxieties that will remain, perhaps even intensify as he implodes. So it’s one thing to resist Trump; it’s another, longer project to build a just and truly plural America out of the divisions he’s exploited. Abrams’s campaign offers insight for that work. Abrams and Phillips are doing the math. But there’s a deeper point here. To counter Trumpism by centering his followers would be to chase shadows. Liberals have waited with indignation for the president’s supporters to realize they got a bum deal, that he’s not really a populist and doesn’t posses a time machine that can whisk them back to a manufacturing economy. But who actually voted for these fictions? Trump was overwhelmingly a white-identity candidate. Coupled with flipping districts that had previously gone to Obama, Trump helped drive up his own white turnout to higher levels than many poll watchers thought was achievable. These were white people who had made it into the middle and upper middle classes without the trouble and cost of higher education, thanks to the racially exclusive social contract of the postwar 20th century. And they chose to believe the lie that they can reclaim the security that is slipping away by rejecting the realities that the 21st century forces upon them. But refusing to center white suburbanites doesn’t mean ignoring them. Whatever else is true about Trump voters, the core complaint I’ve heard over and over as I’ve spoken with them is actually one many of us share: There exists a monstrous gap between the reality so many Americans face every day, and the political priorities of those who have power over us. This gap divides both the Democratic and Republican parties from their bases. It exists in Silicon Valley and on Wall Street. We encounter it when we shop for homes, apply for jobs, and try to go vote. We’re even reminded of it when we try to book a flight and get dragged down the aisle because the airline wants its seat back. The impunity of the powerful is what binds the rest of us. Abrams is an elected official and speaks the language of her work when pointing to the shared values she’s heard in talking to both white and black suburban moms—a desire for economic security, personal safety, a reasonable retirement. “Too often, our conversations are grounded in binary and reductive debates—that my success means your failure, or your success means my failure,” she argues. Agreed. But I’d say the widely shared value today is more Twisted Sister than Mr. Smith Goes to Washington: We’re not gonna take it, anymore. That’s true in Baker County, it’s true in the white suburbia, and it’s a starting point for taking on Trumpism.